Like their cultural kin - the Mogollon and the Hohokam - in the deserts to the south, the earliest Anasazi peoples felt the currents of revolutionary change during the first half of the first millennium. Perhaps in a response to Mesoamerican influences from Mexico, they began to turn away from the nomadism of the ancient hunting and gathering life, the seasonal rounds calibrated to the movement of game and the ripening of wild plants, the material impoverishment imposed by the limitations of the burdens they could carry on their backs. They began living in small hamlets. They broke the land and took up agriculture. Over time, they acquired more possessions, stored food, made pottery, adopted the bow and arrow, domesticated dogs and turkeys. They still hunted and gathered, not as their only avenues for acquiring food, but as a complement to cultivated corn, beans, squash and other crops. In the first half of their history, the Anasazi distinguished themselves primarily through the artistry of their basketry, which they crafted from the fibers of plants. In the second half, they left their mark on a much grander scale, through the construction of perhaps the most stunning prehistoric communities in the United States. The Anasazi would prove be resourceful, adaptable and, ultimately, the most enduring of the Pueblo cultural traditions. The heart of the Anasazi region lay across the southern Colorado Plateau and the upper Rio Grande drainage. It spanned northeastern Arizona, northwestern New Mexico, southeastern Utah and southwestern Coloradoa land of forested mountain ranges, stream-dissected mesas, arid grasslands and occasional river bottoms. Large game, including mountain sheep, elk, mule deer and black bear occupied the mountain slopes, valleys and meadows. Tassel-eared Abert’s squirrels inhabited the ponderosa forests. Beavers dammed the smaller streams and tributaries. Pronghorn, or antelope, grazed the grasslands. Migratory water birds appeared at mountain ponds and flatland playa lakes during the fall. The growing season at the highest elevations lasts no longer than a few weeks. In modern times, 35 to 40 inches of precipitation, much of it in the form of heavy winter snows, fall on the mountain peaks in a typical year. Winter temperatures can drop to an Alaska-like 40 to 50 degrees Fahrenheit below zero. The growing season in the middle elevations  6000 to 8500 feet, where we find numerous Anasazi ruins  lasts four to five months. Some 15 to 20 inches of precipitation fall in an average year at a rate of one to two inches per month. Typical daily midwinter temperatures range from 18 to 40 degrees Fahrenheit, and daily midsummer temperatures, from 55 to 85 degrees Fahrenheit. The growing season in the lower elevations  the arid grasslands and river bottoms, where, again, where we find many more Anasazi ruins  lasts seven months or longer. Annual precipitation ranges from 8 to 12 inches, most of it falling in late summer and early autumn. Midwinter temperatures range from 23 to 47 degrees Fahrenheit, and midsummer temperatures, from 64 to 91 degrees Fahrenheit. As we see from the analyses of tree rings, which serve as a year-by-year indicator of rainfall, precipitation during Anasazi times often equaled modern averages. Just as often, however, it fell short by as much as 20 to 40 percent, with the drier periods lasting from decades to centuries. Wetherill, a Colorado rancher who would become a legendary archaeologist of the Southwest, had already discovered some of the major Anasazi "cliff dweller" communities of Mesa Verde, in southwestern Colorado. (Frank McNitt tells his story in Richard Wetherill: Anasazi.) Now, in neighboring Utah, he had discovered the cliff dwellers’ cultural ancestors, the Basketmakers, who emerged from their 6000-year-old Desert Archaic hunting and gathering traditions about the turn of the first millennium. They began to settle down although their restless spirits still summoned them from their small settlements and fields to seasonal hunts and wild plant harvests. Before about A. D. 500, Anasazi Basketmaker groups  probably extended families  took their shelter in caves and rock overhangs  "rock shelters"  within canyon walls, preferably facing the south so they could capitalize on warmth from the sun during the winter. Occasionally, like the early Mogollon and Hohokam peoples, the early Basketmakers lived in small semisedentary hamlets in open areas. They left many clues to their occupations in the northern part of the Anasazi range, from Utah to Colorado, especially in the vicinity of Durango. In one site, located on terraces above the Animas River in southwestern Colorado, "The floors of 35 houses were found?, many of them superimposed over others," according to Gordon Willey in his book An Introduction to American Archaeology, Volume I. An early Basketmaker group built the houses, roughly circular and typically eight or nine feet in diameter, over saucer-shaped depressions. Called "pithouses," they "?were walled with a curious wood-and-mud mortar masonry?" said Willey. "Entrance must have been through a small side door, without a passage entryway. The buildings were heated by placing large hot stones in a small central heating-pit." The Basketmakers often dug bottle-shaped, egg-shaped or open storage bins in the floors of their houses, covering the pit walls with plaster or stone slabs. In some instances, they built large structures, 25 to 30 feet in diameter, which they may have used for community gatherings or ceremonies. The early Basketmakers clothed themselves in fur- or turkey-feather robes, string aprons, loincloths and round-toed, plant-fiber sandals. They wore ornaments made of shell, bone or stone. They likely raised their crops  at this time, primarily corn and squash  in garden-like plots rather than in large fields. Apparently unaware of the bow and arrow, the men hunted the larger game animals with the spear, which they hurled with the throwing device we call the "atlatl." Women gathered wild food plants such as amaranth, pinyon nuts, Indian rice grass, sunflower seeds and tansy mustard seeds, and they used coarse stone basins to grind domesticated and wild seeds into flour. Unaware of pottery  or unwilling to accept it  the women prepared meals in pitch-lined baskets, cooking with fire-hot stones dropped directly into the food mixture. In an apparent indication of a passion for diversion, the early Basketmakers played games with a variety of small disk-like "gaming pieces." Possibly as part of ritual, they smoked tubular-shaped pipes, blowing smoke plumes into the air, mimicking and soliciting rain clouds in the sky. In an evident expression of their love for beauty, they carved the blossoms of flowers from pieces of wood. They buried their dead in a flexed position, fully clothed, either within or nearby their lodges. They left a body with offerings of basketry, weapons, tools and ceremonial objects. The Basketmaker people lagged behind their southern neighbors by centuries in making and using pottery, but they raised the ancient craft of basket making to high art. They made one style of basket from tightly coiled pliable plant fibers and another from plaited plant fibers. They fashioned their baskets into a wide array of shapes and sizes, often incorporating elaborate designs into the texture. They used the baskets, not only for carriage of possessions, preparation of meals and offerings in burials, but also for sifting of seeds and flour, storage of grain and personal and ceremonial items, transportation of water and, according to Wetherill, even as possible head covers and as nominal caskets. Archaeologists have found the baskets primarily in early Basketmaker sites within dry caves and rock shelters, which have protected and preserved normally perishable items through time. About the middle of the first millennium, the Basketmakers quickened their pace of change and increased the diversity within their culture. They began to build some larger villages, with far more storage bins, possibly signifying increased yields from their fields. In west central New Mexico, for example, two village sites apparently "embraced over 50 pithouses apiece," according to Willey. Although they continued to hunt and gather, the later Basketmakers invested more labor to build more substantial and longer lasting lodges, some circular, some oval, some rectangular in floor plan. At a village in northwestern New Mexico, they lined the excavated walls "with large stone slabs" or "with mud plaster," said Willey. "The roofs were supported by four posts set in the floor at some distance from the corners, or the approximate corners, of the pits." In Linda Cordell’s paper, "Prehistory: Eastern Anasazi," published in the Handbook of North American Indians, Volume 9, Southwest, she said that the interior features of lodges at the village included "antechambers, central often slab-lined fire pits?deflectors and sipapus." A sipapu  a small hole in the center of the lodge  probably served as a symbol for the mythological opening through which, according to Anasazi belief, the people first emerged from the world of the underground onto the surface of the earth. The later Basketmakers also built the first Anasazi large semisubterranean ceremonial chambers, or kivas. At the village in northwestern New Mexico, they built a circular kiva nearly 40 feet in diameter. "Its walls were carefully faced with stone slabs," said Willey, "and a low encircling bench had been built up around the interior base of the wall with smaller facing slabs and rock and adobe fill." In addition, the later Basketmakers expanded their trading range, acquiring marine shells which they used to make beads and pendants. They became more distinctly agriculturists, adding beans to their suite of food crops thereby significantly improving the nutritional value of the products of their fields. They domesticated the turkey, which joined long-domesticated dogs in the village compound . They adopted the bow and arrow for the hunt, gradually giving up the lance and atlatl. They adopted new and more efficient grinding basins for processing grains. For the first time, the Basketmakers begin to make and use pottery, at first, a simple gray ware and later, decorated gray and white wares. As they turned increasingly to pottery as their containers and cooking vessels of choice, they allowed their age-old skills in basket making to decline. Perhaps most significantly, the Anasazi Basketmakers set the stage for the rise of the Anasazi Pueblo peoples, who would take their place on the stage of the Colorado Plateau and the northern Rio Grande basin about A. D. 700. In the beginning, the early Puebloans built the traditional pithouse lodges and semisubterranean kivas, but they also began to erect jacal or masonry surface storage structures. (Jacals are buildings with walls made of posts, sometimes covered with adobe and rock facings.) With the passage of time, they moved out of their pithouses and into the surface structures, adding more rooms for storage. Within some two to three centuries, they had begun building planned villages, in many instances essentially standardized in arrangement across the Anasazi region. The villages had "long, double arced rows of contiguous surface rooms with a deep squarish pit structure placed?in front of the surface rooms," according to Linda Cordell in her Archaeology of the Southwest, Second Edition. "The surface rooms?served both for storage and as residences. Back rooms that lack floor features, especially hearths, most likely were used for storage. Interior doorways connect these to front rooms with hearths. These, in turn, may open on a portico or outside work area?" The Puebloans frequently constructed the buildings on a north to south orientation. They usually lined the pit structure with masonry, underscoring its importance to the village. They tossed their trash into a common heap, which archaeologists call a refuse midden. In some villages, perhaps with several hundred residents, they built more than 100 rooms and more than a dozen pithouses.
" according to Fred Plog in his "Prehistory: Western Anasazi," published in the Handbook of North American Indians, Volume 9, Southwest. As they would throughout their history, the Anasazi continued to hunt and gather to supplement their crops, which were always subject to failure in an arid land with capricious rainfall. Like their Basketmaker predecessors, they made simple styles of pottery, most commonly a gray ware with a corrugated surface. They began, for the first time in the Anasazi region, to use cradleboards which inflicted deformation on the skulls of their infants. In northwestern New Mexico, they left evidence of the dark clouds of conflict. Cordell said that "
numerous burned dwellings and human skeletons that had been burned and cannibalized are considered indicative of warfare." On average, the early Puebloans occupied their villages only for a generation before they abandoned them, perhaps as a result of resource depletion (for instance, wood, game, wild plant foods); environmental calamity (especially extended drought); social disintegration (political fractures or factional feuds); outside threats; or some combination. Late in the first millennium, the Anasazi Pueblo people began to redefine themselves. Energized by dynamic leadership or by outside  possibly Mesoamerican  voices or by a new self-awareness and community spirit, the Anasazis gave birth to the far-reaching development called the "Chaco Phenomenon," with its heart in a 10-mile segment of northwestern New Mexico’s Chaco Canyon.
" noted Richard Wetherill in a letter reprinted in the Listers’ book Chaco Canyon. " there are 11 of the large Pueblos or houses containing from one hundred to 500 rooms each and numerous small oneshow many I do not know but there must be more than 100." Wetherill would cement his archaeological fame at Chaco Canyon. The Chaco system comprised the cluster of Chaco Canyon’s settlements  "magnificent pueblo great houses," Cordell called them in Archaeology of the Southwest  and an integrated network of large and small outlying communities, most connected to the core by a network of converging roads. The Chaco Canyon great houses communicated with their "outliers" by way of signaling stations perched on the crests of hills, where archaeologists have found the remnants of signal fires and highly reflective obsidian slabs, the tools of the prehistoric signaling trade. Chaco and its communities shared a common ideology, which almost certainly revolved around agriculture, astronomical observations, the seasons, water and hoped-for prosperity, with seasoning from ancient hunting and gathering rituals. The Chaco network blanketed much of the Anasazi cultural region. Its influence radiated well beyond the region. Looking back through time, which shrouds the history of the Anasazi, archaeologists struggle to unravel the story of the Chaco Phenomenon. "We conceive of Chaco Canyon and its 80 or more?outliers as a vast wheel. The hub at Chaco Canyon, its spokes, or roads, directed outward to the rim, its outliers." said David E. Stuart and Rory P. Gauthier in their book Prehistoric New Mexico, Background for Survey. "?the beauty of such a system is several-fold. The effects of uneven crop years are spread over a vast area. By managing surplus, a momentarily failed outlier can be subsidized by supplies sent down a spoke with little information passage between outliers." Other archaeologists suggest the roads may have served as symbolic conduits for pilgrimages from the outliers to Chaco Canyon, which may have offered regeneration of the spirit and astronomical forecasts for the coming seasons for planting and harvest. 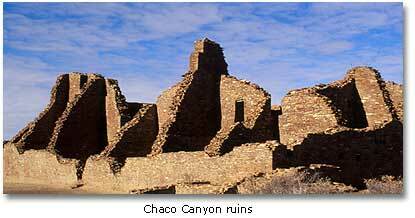 Others view Chaco Canyon as a dynamic commercial center for agricultural production, food redistribution, ceramic and turquoise crafts manufacturing and long distance trade. By contrast, archaeologist Lynne Sebastian, says Cordell, thinks that the Chaco Canyon great house settlements may have been primarily displays of power and wealth, seats for ostentatious competing leaders who traded religious knowledge for community allegiance. By the middle of the 12th century, possibly as a result of some combination of drought, overpopulation, depleted resources and discredited political and religious leadership, the Chaco Phenomenon collapsed. The population scattered, probably in a series of migrations. Near the end, one remnant, perhaps social elites, moved 65 miles northward to build one last "magnificent pueblo great house" on the banks of Animas River, a few miles below the Colorado border. Called "Aztec" by early EuroAmerican settlers, who thought that the indigenous Indians could never have built so elaborate a community, it, too, would fail. The residents left. As the Chaco Phenomenon waxed and then waned, another Anasazi branch  the San Juan/Mesa Verde people  who occupied southeastern Utah and southwestern Colorado, built small scattered pueblos on mesa tops and talus slopes. Starting early in the 13th century, they built pueblos with mysterious and strangely shaped towers at the heads of canyons in Utah, and they built Wetherill’s famed "cliff dwellings" in the great stone alcoves of Mesa Verde. 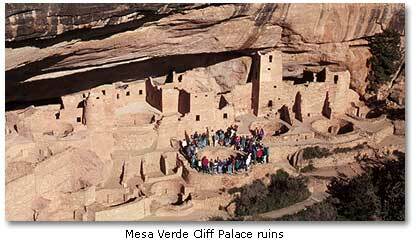 By late in the 13th century, the Mesa Verde system collapsed, and the population migrated to new areas. To the west, across northern Arizona into southern Utah and southeastern Nevada, another Anasazi branch  the Kayenta  built pueblos so scattered and small that Cordell calls them "homesteads." In the 13th centuries, the Kayenta of northeastern Arizona built and enlarged their own spectacular cliff dwellings, including White House, Antelope House and others in Canyon de Chelly and Kiet Siel, Betatakin and others in Tsegi Canyon. 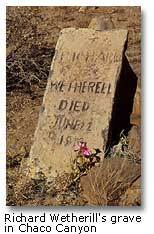 But by the end of that fateful 13th century, most Kayenta villages, too, had collapsed. The population scattered, moving into new areas. To the south of the Chaco and Kayenta regions, immigrants from areas in decline apparently settled the Hopi villages in northeastern Arizona and the Zuni, Acoma and Laguna villages in west central New Mexico. To the east of Chaco Canyon, in the upper Rio Grande drainage with its more dependable water flows, the Anasazi population began to increase during the 13th century, presumably a result of displacement from the waning Chaco and Mesa Verde regions. True to their roots, the new immigrants raised large, multistoried pueblos, some with populations in the thousands, along both sides of tributaries as well as the main stream of the river. It is the pueblos of northwestern Arizona and western New Mexico and those of the upper Rio Grande drainage which greeted the Spanish expeditions into the Southwest in the 16th century. The last of those pueblos now stand as living monuments to the endurance of the Anasazi traditions, the cultural strength, the adaptability, the resourcefulness of an ancient people. In the next article of this monthly series, we will explore the architecture and construction of the Anasazi at the pinnacle of their history.